Here's a shot from Tirza in Amsterdam. It seemed like the best photo to post today. These shots were taken a few years back at a private party in Destin, Florida. 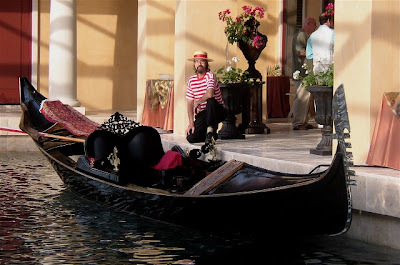 The gondolier is Robert Dula (a.k.a. "the gondolier who has witnessed more hurricanes firsthand than all the rest of us put together"). The host of the party was a "world traveling Elvis impersonator" named Ron Adams. The party was a Junior League fundraiser. Mr. Adams must do a good job impersonating "The King", because he's got a 12 million dollar home, with something we don't often see: a pool that's actually big enough for a Venetian gondola! They sought me out, not knowing about what I went through in New Orleans, and caught up with me, shortly after all the repairs were made. It is how I got my feet back on the water, and ultimately wound up in Huntsville. Robert rows his gondola now at a new development in Huntsville, Alabama. I've posted this link before, but there are some great new photos that make it worthy of a second look. 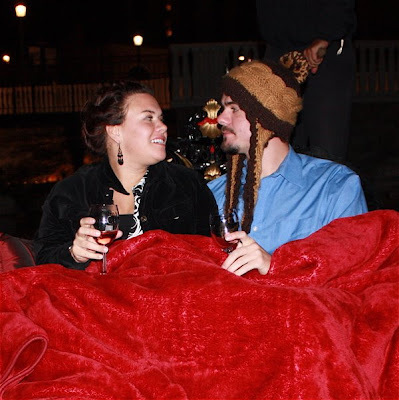 Robert sent me a recent photo taken on board his gondola using a Canon Rebel Xsi with a remote controlled shutter release. I'm not exactly sure what the deal is with that hat (I think maybe that guy lost a bet or something), but just above the hat you can see Robert's left hand on the remo. We can't see his right hand because he's activating the camera with it...while rowing. After the chorus of "wows" for the last Squero Canaletto post on October 8th, I thought I'd post up a couple more great images from the same collection. This rare view shows how the asymmetry is built-in to the hull. Here are two gondolas at different stages of development. Thom Price, Mathias Luhmann, and Sean Antonioli spent a relatively short time building gondolas at Squero Canaletto (small only when compared to other squero operations which can roun for generations), but during that time, they got to do things most of us only dream of. or at least that was how it felt. Nereo and I had been walking for the last 45 minutes, and during that time, I gained a true appreciation for just how fast that guy can walk. Our objective was to find the hidden headquarters of the Remiera Francescana and meet with the famous Vittorio Orio. try keeping up with a Venetian and it's downright exhausting. Not surprisingly, I found myself playing catch-up with Nereo on several occasions. During one of those catch-up moments, just outside the wall of the Arsenale, I encountered this sandolo. but there it was - a beautiful black sandolo. The couple were having a wonderful time, and the sandolista (the sandolo version of a gondolier), like so many gondoliers I know, was living the dream. We finally did locate the Remiera Francescana, and had a great meeting with Vittorio Orio. It was the first time I would meet the man, but not the last. 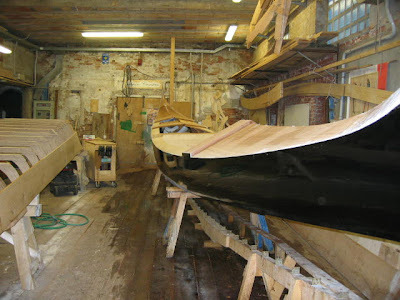 In fact it was during that meeting, in a room full of boats, that Vittorio, Nereo and I began to discuss plans for an expedition in North America. 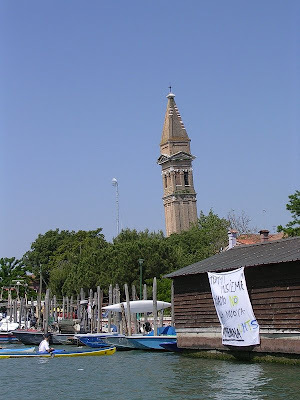 I saw a lot of amazing things during Regata Storica in 2005. Some of the boats in Venice seem to only hit the water for that one day of the year. Many are dressed up or have people on board in extreme costumes. Of course there are the ubiquitous gondolas- most with paying passengers, some with friends and family of the gondolier. But from my spot on a very long boat, I also saw private boats, one of them caught my eye when I happened to have a camera handy. To my surprise, one of the passengers was Saverio Pastor. 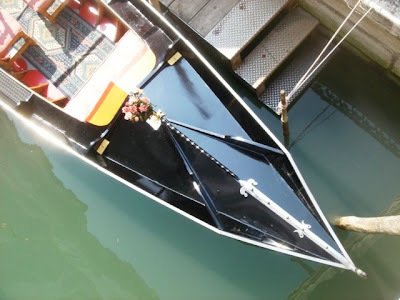 When I was contemplating the best way to introduce this post, I considered asking the question: "What kind of boat does the world-renowned remer of Venice, Saverio Pastor like to travel around in?" It seems to me that someone like Saverio would be able to choose his ride, and if that's the case, it looks like he chose well. I'm not absolutely sure, but I believe the boat is a modern version of the old "gondola da fresco" which was popular back in the days of nobility. Some resembled gondolas more than others. I've seen photos of them with and without the signature ferro. Nereo Zane took a few good shots of one in my post of August 12th. 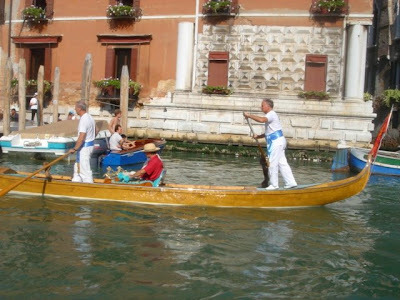 With a gondola da fresco, owners would enjoy an afternoon cruise in their boat while their rowing employees would chauffeur them around. It was all about "seeing and being seen". 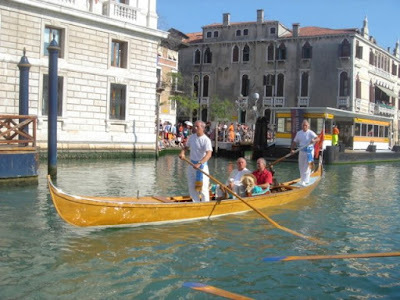 These boats were a bit smaller and lighter than a gondola but often had the same parecio. If you take a close look you'll see a main seat, or "divan" like the one on a gondola. Brass horses, or "cavalli" adorn both rails of the vessel about midship, and they are mounted on miniature versions of the arm-pieces seen on gondolas known as "pusioli". Because this is not a passenger-for-hire boat, the owner can choose whatever paint scheme he or she wants. 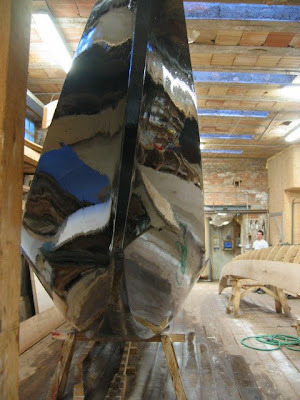 And of course nothing is more striking (and difficult to maintain) than a fully varnished boat. Frequent Gondola Blog readers will know that I'm a sucker for varnish. The parecio is done in a unique color as well: it's a light blue that arrives on the color-wheel in the lighter end of turquoise. The seat is fringed in it, as are the pusioli. The cavalli even have pom-poms of the same light turquoise hue. The tapeto (gondolier's carpet) seems to be a close match as well. I'm going to go out on a limb and guess that the same color can be found on the "pagioi" (that's a fancy venetian word for floor boards). 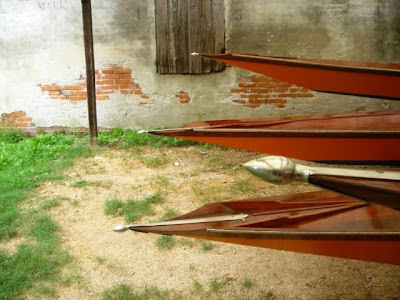 It is common for gondoliers to match their sashes or hat ribbons with the color of the pagioi. I suspect that's why these two vogatori are wearing light blue sashes. It's not an exact match, but I applaud them for getting closer than I probably could have. One would expect that if Saverio Pastor was riding in a boat, the forcole would be of excellent quality, and these two pieces certainly don't disappoint. The forward forcola has a generous sanca (elbow) sticking out, and the forcola da poppa has two morsos. This is most often seen on boats that are frequently rowed both "laden and light" - that is to say, half the time the boat is heavy, full of passengers or freight, while the other half it's empty and floats higher in the water. Having two morsi allows the gondolier in the back to adjust his oar placement accordingly. One last comment on those forcole: They are not lightweight fare. They look like they could withstand a lot more than they'll ever need to on a boat such as this. 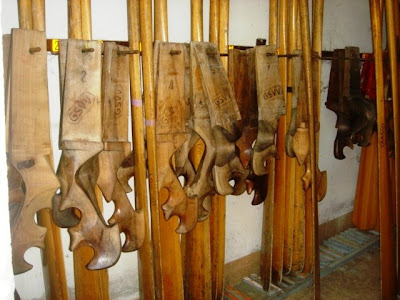 think Saverio carved them? Several questions still linger: - Who owns the boat? 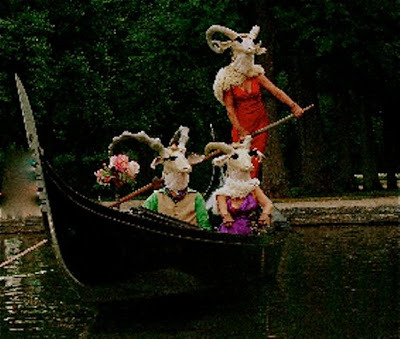 Is it Saverio's private vessel or does it belong to modern Venetian nobility? They still exist, you just have to look for them. - What's it like to row such a gem as this? - How old is she? She's certainly well-kept. No, I did not Photo-Shop the sun's reflection on that stainless steel rubrail. - Where can I get one?! photo by Sean Antonioli During his recent visit to Venice, Sean snapped a shot of Venice's fourth bridge, which stretches from Piazzale Roma to the train station. Spanish architect Santiago Calatrava designed the 94 meter span, which has raised as much notoriety as it has criticism over the last year or so. 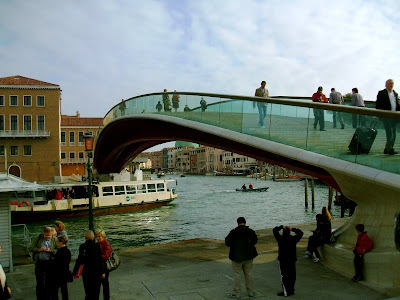 You can read more about Venice's "fourth bridge" in my post from July 27th. Most of the postcards we've examined here have been retouched color photos or fully illustrated artist's renderings. Once in a while I get to post an actual monochrome photograph postcard from "way back when". Better still, I have for you today, a unique opportunity to see a bridge and waterway right after they were built, and then again, just before they disappeared. The waterway featured here is the Coral Canal and Venice Lagoon, and the bridge is the Coral Canal Bridge which was located next to Venice's famous bath house. 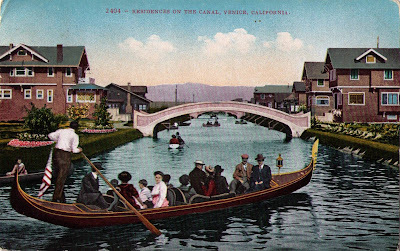 The Lagoon and some of the freshly dug and cemented canals of Abbott Kinney's Venice were first flooded with water from the Pacific at the end of June, 1905. The first gondolas were launched in July of that same year. So the image we're looking at may be one of the very first photos published of gondolas on the water in Venice, and possibly all of Southern California. Take a look at those gondolas. they were fresh off the steamship when this photo was taken. Chances are that the gondoliers rowing them were scratching their heads in amazement as the city and her canals developed around them. To borrow a phrase: Venice wasn't built in a day. Each canal segment was dug or dredged before becoming part of the existing network of canals. Coffer dams were implemented to allow workers to complete each segment before the water came in. The complete waterway was finished in September of 1905. By the time this photo was taken, the gondoliers, who had been hired in Venice along with their boats, were probably itching to row after having their gondolas out of the water for so long. Nobody knows exactly how old each of the gondolas were when they were brought to California. 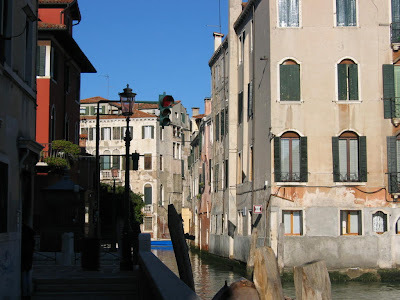 All told, there were about three dozen Venetian gondolas in this "new Venice". Knowing a thing or two about Venetians, I think I can safely assume that they obsessed over their gondola's appearance, and while waiting to launch, made sure every detail was either perfect, or "painted over". Now imagine you're on the shore to the very far left of the shot, looking towards the bridge. 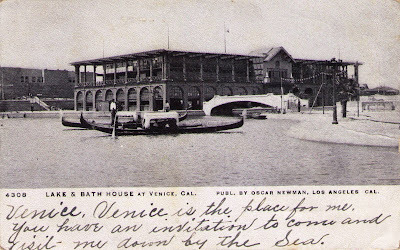 OK, now travel through time a hundred years, imagine that the canals have all been filled in and paved over, the bridge has been removed and the bath house replaced with eclectic Venice Beach businesses. The wide road in the immediate foreground was never part of the waterway. The canal shoreline was where the long crosswalk is today. The lone woman walking with swinging arms is headed towards where the bridge used to be. The bath house was on that corner. The two people waking away from the camera are in a crosswalk that roughly mirrors where the bridge used to be. I'd imagine that most people whomake that walk have no idea that there used to be a bridge there. The photo is said to originate from the 1930's, but that date would be impossible since the waterways in this photo were filled in and became roadways before the end of 1929. My guess is that the photo was taken between 1927 and 1929. Take a look at how the bridge has aged over twenty-plus years. What really interests me is the condition of the gondola. It appears to be getting toward the end of it's life. The ferro is either so bashed up that it hangs over to one side, or more likely, the metal ferro has been replaced with something more flimsy. Check out the rather non-stock tail decoration. Some day I'd like to find out where some of those gondolas ended up. I don't know if there's anyone who was around "way back when" who might still be alive. Venice, California may not have been in her prime for very long, but during that time, it must have been amazing. She has left an enduring legacy - with canal neighborhoods and Venice-themed malls and casinos in so many places. Here's a great old photo, taken in 1909, in Venice, California. This angle may look familiar - many photos of Abbott Kinney's Venice have been taken of this exact angle. I published a "Postcard History Lesson" on a card with a similar image on July 21st. Here's that postcard again: What you're looking at is the view east up the Alderbaren Canal. Of course if you go there today, you'll find no such waterway because, like so many other canals in Venice, California - it was filled in and became a road. but if you really want to, you can drive up that canal. It is now called Market Street. "imitation is the best form of flattery". Nothing could be further from the truth with Venice. A casino in Las Vegas will attest to that, along with an even bigger one now in Macao. Dozens of malls, stripmalls, and other architectural works needing a theme have been dressed to look like Venice. After the Houston Expedition in April, my wife and I headed back up the 45 towards Dallas. Many years ago, my company bid on a project in a Houston suburb across the highway from the well-known Woodlands mall. My friend Simon Goodyear got the contract, and helped them set up a gondola operation. Simon did a great job, but not all gondola operations succeed. 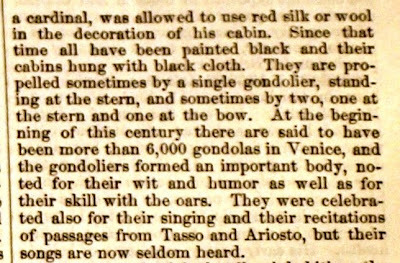 The gondolas ended up being sold, but the Venetian theme remained. 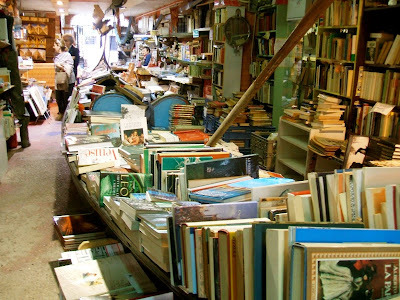 And, oh yeah, they went overboard in some areas. Doges and winged lions are displayed in several places. Some parts of the mall can be deceiving, especially if you see them in monochrome. Now here's the full shot in color, and also with the retailer's sign and a big ol' Texas truck. And here's the full shot in color. At first you think you're in Piazza San Marco, then you realize that it's not Venice, it's Famous Footwear. Mmmm, and then there's my truck with the expedition gondola! Now maybe I've missed the inspiration for this in Venice, but there's a very dramatic fountain in front of Famous Footwear. Very dramatic. Actually quite painful looking. And just to make sure you feel like you're in La Serenissima, there are these lamps all over the place. I stopped by Sunset Gondola today to toss the bocce balls with Tim and Tyson and couldn't help but reach for my camera. The Venetian flag catches the wind over Huntington Harbor. This is what happens when you beat Tyson at bocce. A bundled cover rests on the bow of the pupparin. A close-up on the most-rubbed part of this gondola's rail. A sandolo/mascareta hybrid floats alongside one of Sunset's three gondolas. 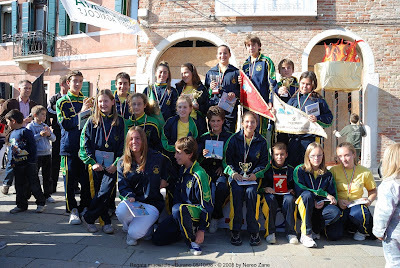 Sunday, October 5th, 2008 saw the Regata delle “Maciarele” of Voga e Para. 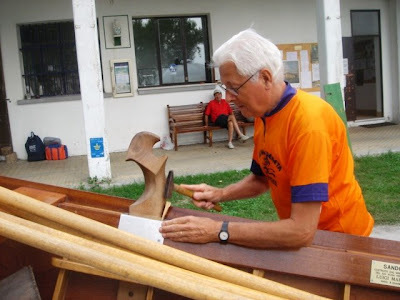 Voga e Para is a rowing club in Burano, founded by the well-known Bepi Suste. As Bepi has said – they are "the pesciolini of the lagoon before becoming adults". Well, these “little fish” may be young (8 to 12 years old), but they are good. Of course, I would expect nothing less than “amazing” from Bepi. 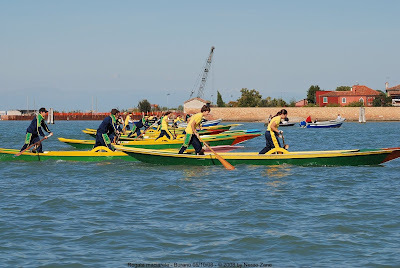 The Voga e Para club has a website that has some great photos in the gallery. I spent a long time looking through the various photos and it made me consider staying in Burano next time I go to Venice. Nereo Zane took these photos and has published a more extensive post on his blog. photo by Sean Antonioli Sean sent me this rare shot of the oft-talked about but rarely seen traffic signal in a canal on the west side of Venice. Click on the image and look closely to see the signal - suspended above the water. I don't know if boaters actually yield to the signal. Once in a while I come upon a product that becomes indispensable from the get-go. The Photon Micro-Light II is a prime example. 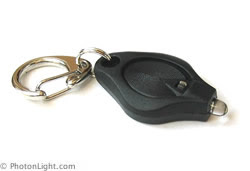 It's about the same size and weight as a quarter, hangs neatly on a keychain, and is as bright as a mini Maglite. But unlike most flashlights, it's always handy, and doesn't go through batteries as quickly. I keep one on every keychain. The best recommendation I can give is one of safety. I can't count the number of times I've used this little light to get the attention of another boater. It amazes me how many people don't see my navigation lights. When I point it at the driver of an oncoming boat and flash it - they always take notice. It's a must-have item that could save your life. I was at friend's house a while back and spotted these old books up on the shelf. I love old books. The older, the better. 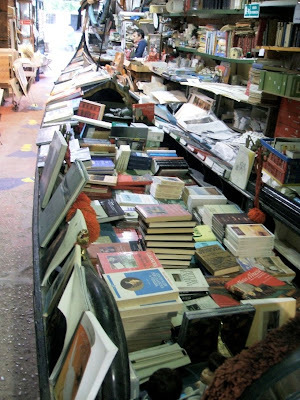 So what does a "gondola fanatic" do when he comes across a set of 120 year old encyclopedias? He grabs volume VIII. The one covering GLA through HOR. 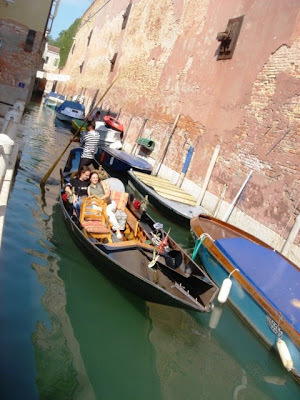 Because they've been around practically forever, and because they are among the most recognizable boats in the world, there's a cyclopaedic definition for "gondola". And because it's such a cool boat, there's an illustration in there too! My 11 year old daughter helped me take a couple photos of what I thought was the most important page of all. Chances are that I'm breaking some copyright guideline by posting these images. But then again, if anyone reading this was involved in publishing these volumes back in 1879, chances are they won't mind seeing their work revived. Mmm, and if they do, they'll probably have a tough time chasin' me down. The description is fairly accurate, but the dimensions are off. 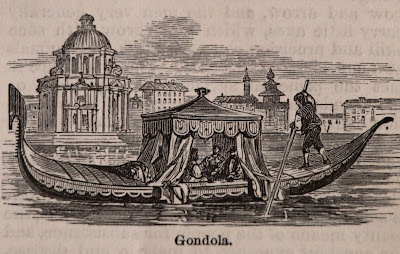 Sure, there were gondolas as short as 25 feet long in Venice, but they were there hundreds of years earlier. by the 1800's, gondolas had reached or at least neared the 36-foot length. What's most surprising, is the apparent absence of a forcola. Looking at the illustration, the greatest conclusion we can draw, is that, visually, things probably got a lot more accurate in these publications after photographs were incorporated.